It’s all in the name at LABRANDA Aqua Fun Marrakech! This is a gorgeous, colorful, beachfront, water park resort! 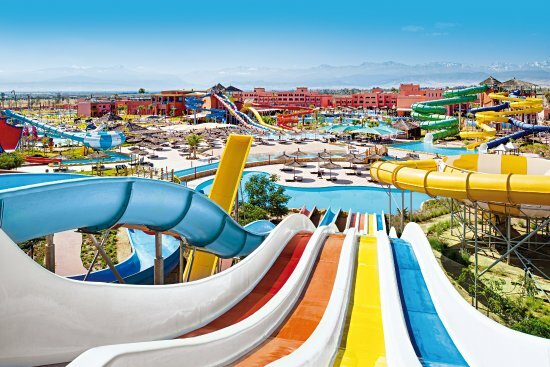 Featuring the largest water park in Morocco, this resort has 58 waterslides and 16 pools — seven of which are just for kids! If you can peel the kids from the pools, head to the beach, playground, or kids’ club. Other offerings include a spa, Turkish baths, fitness center, live entertainment and onsite dining, with kids’ menus and buffets available. Oh, and did we mention this is an all-inclusive resort?! 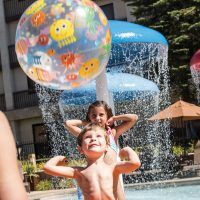 Family rooms (two rooms connected by a door) are available; splurge for one that’s located poolside! All guestrooms are equipped with free Wi-Fi, mini-bars (included in rates), and air conditioning. We were stay for 10 days in the hotel,we had fantastic experience and had the most fun and met the most friendly and great people at animation team,hasna Ayoub and kiki r the most my favourites people,we love them so much and all my family miss them a lot.I will consider go back to Marrakech,because of them. We arrived on a Thursday afternoon. We were early and our room wasnt ready so we were all given wrist bands and allowed to go relax and enjoy the facilities while we waited for the rooms. The staff were so welcoming and nothing was too much effort and they went above and beyond to make our stay the best possible and they did it with a smile. There was not 1 bad thing I can say about this place and there were constantly people cleaning everywhere. The animation team were funny and friendly and walked around chatting to everyone making sure we were all happy. At dinner we were treated like we were famous by the staff who showed us to our table and bought us drinks and even found time to make conversation. We were a family of 6 and we will definately consider going back as we came home feeling so happy. We would like to thank ALL of the staff at this resort as they made this holiday one of the best we have ever had. The food was really good and cooked very well, the meat melted in my mouth and the tagine food was amazing. The animation team were superb and the hotel staff were friendly and very good at what they do and the resort is beautiful and kept very clean. The only thing I didnt like was the market but that's just my personal opinion as others may like it but the kids found it overwhelming.